There has been an increase in the culling of sows due to lameness. Three presentations discussed this topic during the 24th International Pig Veterinary Society Congress in Dublin, Ireland in 2016. A case report was presented by E. de Jong, Animal Health Care Flanders and P. Bonny, practitioner, Belgium. In two Belgian farrow-to-finish herds problems of leg weakness occurred in gilts. Danish gilts arrived in Belgium at 20 kg, stayed in quarantine in a rearing unit and were transported to herd 1 at 180-240 days of age. They were fed a rearing diet ad libitum. Between 8 and 10 days after arrival at the herd almost 50% of the gilts started limping. Only the hind limbs were affected, with discrete swelling of the joints. 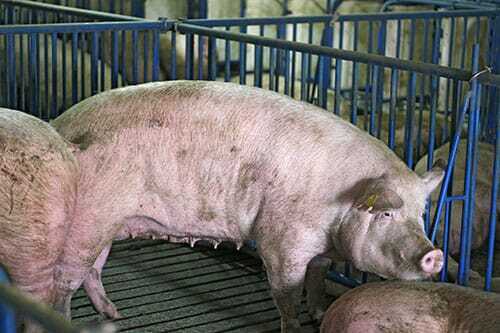 Gilts purchased from different breeding units in Denmark were directly transported to herd 2, where they were kept in quarantine during 15 weeks. The animals were fed a rearing diet twice a day. Gilts were supplemented with 50g monocalciumphosphate on a weekly basis until farrowing. More than 80% of the gilts showed swelling of the joints, with variable degrees of lameness, starting from 1 week after arrival. The differential diagnosis of leg weakness in gilts embraces trauma, OCD, deficits in calcium and bacterial infections. Deficits in calcium be caused by nutritional imbalance. The gilts’ quarantine diets were analysed and serological analyses were done of the gilts. Necropsies were performed on two gilts, together with histological and bacteriological examination. No remarkable deficits were discovered in the diets. Serological analyses showed a normal Ca concentration. However, concentration of P was too high. Serological Ca/P ratios of >4 have been found. Concentrations of osteocalcin were too low (<11µg/l), indicative for bad bone turnover or insufficient bone formation. In addition, CTx, a marker of bone mobilization, was too low. Necropsies demonstrated discrete injuries at the cartilage at the femur heads. Both knee joints were filled with hemorrhagic fluid and mild cartilage injuries were present on the condyles. Histological examination revealed distinct hyperplasia and hypertrophia of the synoviae and perivascular infiltration of round cells, being an image of subacute infectious arthritis. Bacteriological examination showed a positive PCR for M. hyosynoviae. The purchased gilts were probably carriers of M. hyosynoviae. During transport to the herds, they were exposed to stress. This caused a penetration of the bacteria in the blood stream, moving to the joints, resulting in discrete arthritis, swelling of the joints and pain, which resulted in limping gilts 1 to 2 weeks after arrival. Treatment with high dose antibiotics (macrolides and spectinomycines) and NSAIDs solved the acute problem. To avoid similar problems in the future, preventive measures mainly emphasise avoiding stress (stocking density, housing conditions, transport, etc.). Besides, precaution needs to be taken considering nutritional imbalance and (viral) co-infections. In a poster presentation by C. Piñeiro and colleagues from PigCHAMP Pro Europa, Segovia, Spain, the authors evaluated sows eight farms for lameness. Since the implementation of EU Animal Welfare Legislation an increase of culling of sows because of lameness has been steadily detected. Moreover, almost 40% of non-clearly defined reproductive problems as cause of culling might be highly associated with lameness. For this study, a total of 8 Spanish farms were selected and 10% of reproductive sows in each farm evaluated (187 sows in total). Lameness assessment was conducted following a specific scoring system used by Zinpro Corporation. Different types of lesions were assessed including severity (1 = low, 2 = moderate, 3 = severe). Lesions assessed were toes length (T); length and lesion in dew claw (DC); Heel overgrowth and erosion (HOE); Heel-sole crack or separation at the juncture (HSC); separation at the white line (WL); horizontal (CWH) or vertical (CWV) crack in the toe wall. Total percentage of each lesion and percentage by parity were calculated and compared by chi-square test. On the one hand, the study shows that nearly 92 % of scored sows were affected by some kind of claw lesion. Also, the type of lesion is unequally distributed: the most common injury is HOE with 71.66%, followed by DC=62.6%; CWH=38.5%; WL=26.2%; CWV=23.5%; T= 20.3% and HSC=17.1%. On the other hand, there are significant differences in lesion prevalence related to parity. The most affected sows in each farm are from parity 2 (97.2%; p=0.011 ), followed by parity 6 or more (92.1%) and parity 1 (85.7%) of injured sows. Gilts are the group with the lowest incidence (62.5%), close to parity 3-5 group (64.8%). The percentage of sows with claw lesions was higher than expected. Also, the parity lesions distribution showed that the incidence of lameness and claw injury are extremely high in parity 2 sows. This could be related to the second parity syndrome, but this needs to be confirmed by further research. In an oral presentation by A. DeDecker and colleagues from Smithfield Hog Production Division, USA and researchers from Zinpro Corporation, USA indicated that trimming long toes has become a topic of interest for improving sow retention and herd productivity. However, there is limited scientific evidence that trimming long toes in commercial sow farms results in improved productivity and therefore is economically justified. The objective of this study was to evaluate the effects of trimming long toes, overgrown heels and long dewclaws on sows and the impact this has on longevity and productivity to determine economic return. Previous published literature suggests that average toe length for sows is 55 mm from coronary band to tip of toe. 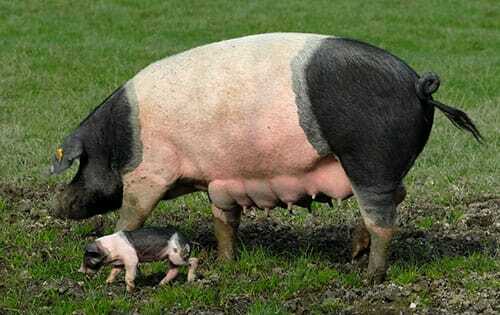 Therefore, seven hundred and sixty parity 2 and 3 sows with toes longer than 60 mm at mid-gestation either had toes trimmed or left untrimmed. Toes were evaluated for toe length, long and cracked dew claws, heel erosion or overgrowth, and heel and wall cracks. Time to trim toes was measured. All sows had the opportunity to have 3 farrowing events and standard litter traits were recorded for each farrowing event as well as total productivity. If a sow was removed from the herd due to being culled, mortality, or euthanized, the date and reason was recorded. Parity 2 and 3 sows that were determined to have toes longer than 60 mm had rear toe lengths averaging 78 mm, while 97% of those sows had issues with dew claws and 83% of those sows had heal sole cracks. Trimming toes can take as long as 31 minutes or be as quick as 3 minutes, with an average of 8 minutes per sow. Trimming long toes increased the average number born alive (P < 0.05) of sows that farrowed for the third farrowing by 0.6 piglets than sows with long toes that were left untrimmed. However, trimming long toes did not improve (P > 0.10) any litter traits for the 2nd farrowing or sow removal, compared with sows that were left untrimmed. 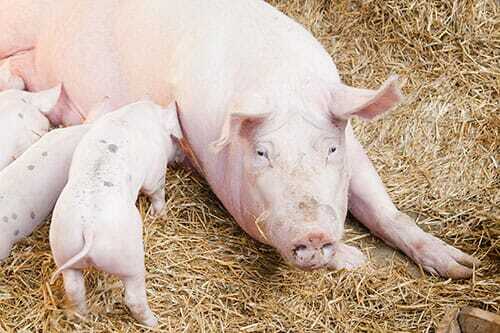 Six percent of sows in the herd had toes longer than 60 mm. Trimming long toes of parity 2 and 3 sows resulted in 0.6 more pigs born alive during the third farrowing event after trimming, but no improvement in sow retention or total sow productivity occurred. The return over expense (ROE) for trimming the 6% of sows with long toes was calculated with capital and labor cost for year one and labor cost for year 2 divided by the value of increased pigs born alive which occurred in year 2. First year ROE is 0:1 and year two ROE is 2:1. Due to a low ROE for trimming toes that were longer than 60 mm of parity 2 and 3 sows, it is suggested to focus on prevention of long toe growth.